After a big wildfire, it's fairly common to see posts on social media claiming authorites are urging anyone near the fire zone to put water and food out for wild animals fleeing the flames. The meme has already been widely debunked, but that doesn't stop local residents and celebrities alike (are you reading this, Moby?) from racking up shares amid California's now-year-round fire season. And it seems like the right and compassionate thing to do. Why not help animals who've lost their habitat and are searching for food? 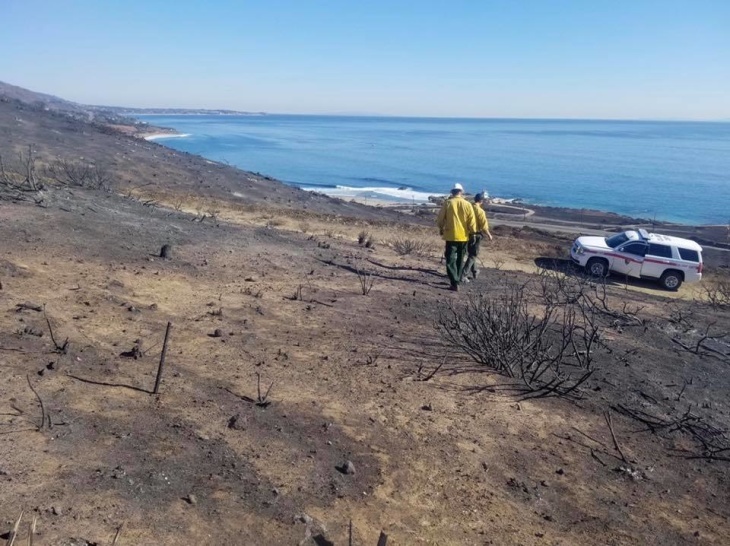 But it's not that simple, as state and federal wildlife officials have regularly explained — most recently after the Woolsey Fire, which devastated Malibu and burned about 88 percent of National Park Service land in the Santa Monica Mountains. 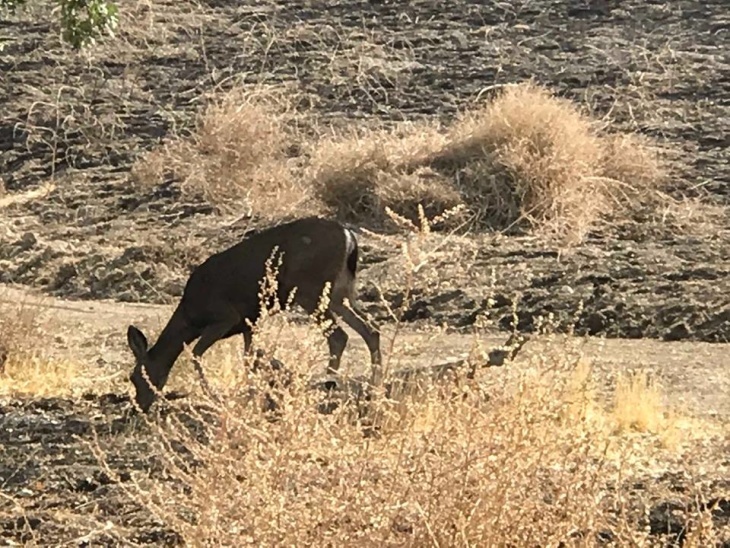 Many Southern Californians have a deep love for local wildlife, but acting on their concern can impede federal law and put both humans and animals at risk, according to NPS spokeswoman Kate Kuykendall. 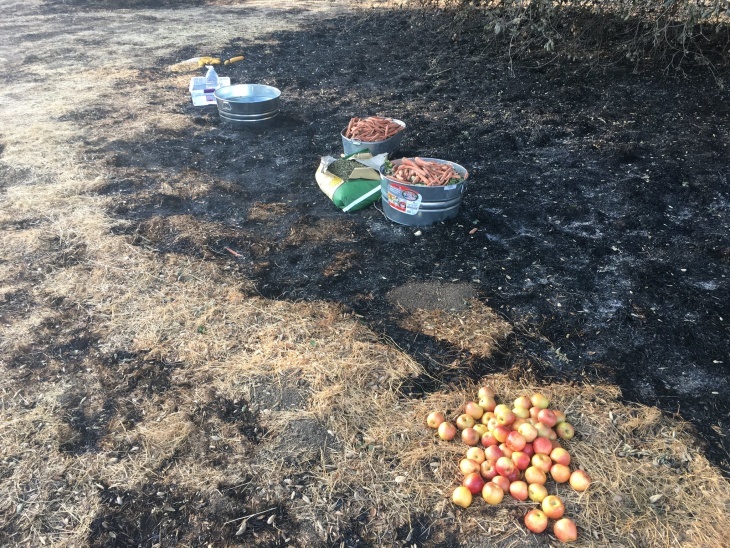 It's a violation of federal law to feed wild animals, but that's not stopping people from hiking into the burn zone and leaving hundreds of pounds of food, including hay, carrots, corn, apples — even chocolate, Kuykendall said. "Putting chocolate out is really not a good idea," she said, adding that NPS rangers have raked up and collected more than 200 pounds of food that's been left out on park land. Park Service officials in the Santa Monica Mountains shared photos of some of the buckets of food and water they've found in the park. "We are urging the public to stop this practice because, quite simply, it harms wildlife," NPS officials posted on Facebook. The resulting comment thread was a case study in the impassioned division among nature lovers, with non-experts weighing in with their own beliefs about how to help animals after a devastating fire. On one side: "Keep feeding and helping them! They are starving! This is an exemption!!" On the other: "Stop your human meddling and let nature do its thing." Kuykendall and other NPS officials said that while people's intentions are "commendable," they could end up hurting the animals they want to help. "What is the absolute best thing you can do for wildlife? Leave them alone and let them figure this out," one NPS ranger wrote on Facebook. "Feeding wild animals food sources that are not naturally found in the Santa Monica Mountains can make the animals sick. Water left out in buckets and other containers can lead to the easy spread of disease from one animal to another." Park Service biologist Justin Brown, who has studied wildlife in the Santa Monica Mountains for eight years, said the biggest threat to the animals isn't starvation, but safety. "It's more than just food," Brown told LAist Friday. "It doesn't fix the main problem: that there's just not much vegetation out there." No vegetation means no cover, Brown said, meaning prey animals would be exposed to predators if they stuck around to eat the food left by humans. Some of the food might be getting eaten, but a lot was found rotting, according to Brown. And human involvement brings a risk for "long-term detrimental effects" to the ecosystem, he explained. For example, the hay rangers have found dropped in the area. Brown said weeds within that hay could take hold and spread, choking out the chance for native plant species to regrow. In time, that could turn shrub land into grassland. But advice from biologists with decades of experience isn't good enough for everyone. Some of the feeding efforts were being coordinated in a Facebook group named Help Woolsey Fire Wildlife, started by locals "trying to help the surviving wildlife impacted by the (Woosley Fire)." Group members have been posting photos of food and water they've left in the burn zone and asked for others to hike in and around the park to do the same. Some expressed outrage that NPS rangers were taking food out, while others advised hikers place food where officials can't find it and put up signs in neighborhoods asking homeowners to leave out food and water in their backyards. Kuykendall said NPS officials joined the Facebook group in an effort to advise residents of the risks involved in what they were doing, but members didn't want to hear it. "Once we started posting that what they were doing was against the law, they made it a closed group," she said. "People are mad at us and they think we don't care. It's very emotional." Some in the group argued that the severity of the devastation to the ecosystem justified their actions. "Certainly in a normal situation no one (would) advocate feeding the wildlife but this is certainly not a normal situation. This is catastrophic," one member told LAist Thursday. 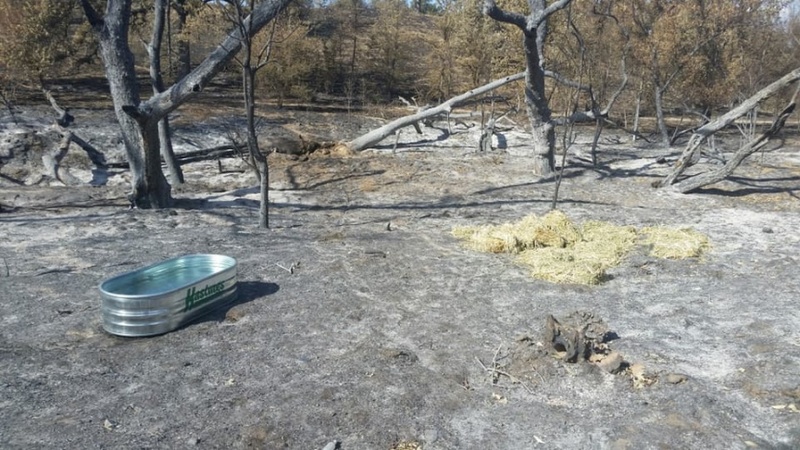 "We have seen rabbits, squirrels, deer and birds who are in burnt out areas with no vegetation (for) miles and miles." According to the member, the group had been in touch with veterinarians "who are in support of putting out appropriate food and water." The group member did not clarify if they had spoken to wildlife veterinarians and what exactly they advised. Brown said he understands the conviction felt by wildlife lovers, some of whom have blasted the Park Service, claiming they're concentrating on the overall species while locals are helping individual animals. "They're very passionate about that particular thing, so it's hard to get through," he said. "We have the same worries. We know we've lost a lot of animals in this fire." NPS officials suggest that people who want to help wild animals should support nonprofit rescue organizations that rehabilitate animals injured in fires, car collisions and other accidents. Kuykendall said park officials have to be careful about the level of concern they convey to the public about some animals, especially the beloved mountain lions. "Literally people start mobilizing on their own to search," she said. That was especially true when several mountain lions and bobcats were missing in the wake of the Woolsey Fire. The missing pumas and bobcats were soon located via their GPS collars, except for one mountain lion — P-74. NPS biologists believe the young male was killed in the fire. Biologists with the Santa Monica Mountains National Recreation Area have been studying how fires affect wildlife in the region for years, most recently in the aftermath of the 2013 Springs Fire. Researchers found that deers and coyotes were able to adapt best to the scorched landscape. Brown explained that deer tend to prefer certain burned areas because of a window in which new vegetation sprouts after a fire. Smaller animals will have a harder time, but Brown said starvation likely won't be a big issue, given the severity of the fire. "These areas are going to be devoid of some species for a while," he said. NPS officials are concerned the region's wood rat population could take a decade or more to re-establish, but said rabbits will bounce back much faster as cover grows back. The surviving animals will have a big challenge ahead of them as they try to adapt to the landscape and establish new home ranges. While the vast majority of NPS land was burned, about half of the acreage of the overall mountain range was untouched by the fire. And with recent rain, and more on the way, biologists are hopeful the area will get a jump on recovery. "Just because a fire comes though doesn't mean there aren't any seeds left," Brown said. "We'll hopefully be seeing some green growth here pretty soon." 12:42 p.m.: This article was updated with information from NPS biologist Justin Brown.